(1) r = (cos(t), sin(t)). (2) r' = (cos'(t), sin'(t)). (3) cos(t)·cos'(t) + sin(t)·sin'(t) = 0. (4) cos²(t) + sin²(t) = 1. The applet below gives a geometric meaning of (3). Note how there are always two equal right triangles, with one rotated 90° with respect to the other. Note also how the direction of this rotation changes four times per revolution. Lastly, pay attention to the relative behavior of cos(t), the blue arrow, and the sin(t), the red arrow. sin(t) grows when cos(t) is positive, which happens in the right half plane. sin(t) decreases in the left half plane when cos(t) is negative. This suggests sin'(t) = cos(t). For cos'(t) the situation is different. For example, in the upper half plane, where sin(t) is positive, cos(t) decreases. It increases in the lower half plane where sin(t) is negative. 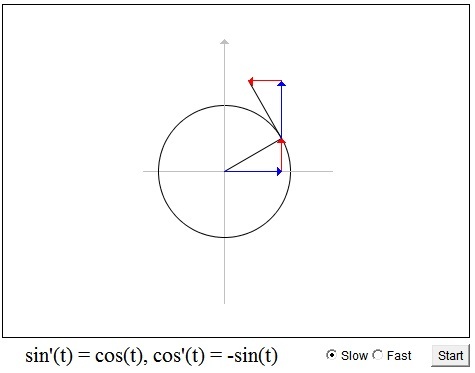 This suggests cos'(t) = -sin(t). eit = cos(t) + i·sin(t). But then from the geometric meaning of multiplication by i, the direcvative of eit would be perpendicular to eit and would have exactly same constant modulus as the function itself. Must not it be tangent to the curve traced by eit? See [Zeitz, p. 142] and [Needham]. (eit)' = -sin(t) + i·cos(t).